The crossing will be installed near Balbirnie Mains, Glenrothes, as part of further improvements to the trunk road. Transport Scotland said it carried out an extensive investigation into potential crossing options following the death of nine-year-old Logan Carrie, who was killed at the location in 2015 after being hit by a car. It said detailed design work for the traffic signal controlled crossing is underway, with a view to having it in place before the end of the financial year. 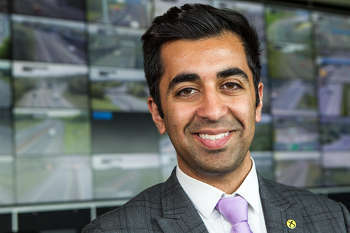 Scottish Government transport minister Humza Yousaf (pictured) said: ‘I previously visited this site and met with Logan’s family. I promised them that my officials would develop a practical solution to improve pedestrian access at this point on the A92 to help prevent a repeat of these tragic circumstances.